Attending school in a brick and mortar building with classrooms, white boards and other students never worked for fifth-grader Jaden. It wasn’t the social aspect, said his grandmother Angela – he’s friends with neighbors of their Holmesburg home, and when he was younger, would love going to the nearby playground. “Something about the building just made him shut down,” said Angela, who acts as his guardian. Jaden’s mother pulled him from school when he was in kindergarten and dedicated her own time to his education, but could be out of work for only a finite amount of time. Angela suggested Agora Cyber Charter School, which her son had attended during his preliminary education. Cyber schooling has been Jaden’s reality ever since. On school days he’ll turn on the laptop provided by the school and begin taking notes from one of the three or four teachers he learns from each day. While his ELA teacher Robin Hartman instructs him to underline a sentence in the text displayed on his screen, he can’t see her, and she doesn’t see him. In 2019, he’s got an arsenal of technology at his disposal. Hartman’s voice is her only real presence to Jaden and the other kids across the state sitting in on the same lesson. If they need to communicate back, they can hit the ‘talk’ button to activate their microphone, or type a question or comment in a chat with the teacher. Once the lesson is over, Jaden and Angela have access to see which homework assignments he has and when they’re due, as well as his grades, notes from previous lessons and tools for research, all organized in a classroom portal. “On a positive note, I’ve become much closer with my students and their parents, believe it or not,” Hartman’s voice told the Times through Jaden’s scratchy laptop microphone once the proverbial final bell rung for the day. Hartman taught at brick and mortar schools before joining Agora 10 years ago, and said the cyber schooling method allows her much more time to talk to students and parents individually. The next two hours of her schedule were allotted to making phone calls. That doesn’t mean Hartman sees fewer students. She teaches three groups a day, each comprised of 25 to 30 students scattered across Pennsylvania. But there’s time in her schedule set aside specifically to talking to parents and students on an individual level – something she said she never saw in her days at a brick and mortar school. “The difference is, in a group of 25 kids, I can create a smaller group and work one on one with Jaden or another student so he doesn’t feel uncomfortable,” she said. There’s also a co-teacher in her class who can help out. Socialization is vital for kids. A typical brick and mortar school experience allows kids to make friends, learn to cooperate and learn to deal with others they don’t get along with. Still, Angela said she had no worries that Jaden was missing out on anything. “He doesn’t want to go to school but he’ll go to camp,” she said with a laugh. Every summer he spends time socializing with other kids during camp activities, and during the school year he and Angela will rarely miss an Agora Day Out. Taking place two or three times a month, parents and kids meet up at locations like stadiums and bowling alleys to give their kids a chance to socialize and have fun. There were just 200 virtual charter schools nationwide during the 2008-2009 school year, according to the International Association for K12 Online Learning, a number that grew to 478 by the 2013-2014 school year, according to the National Center for Education Statistics. Virtual schools accounted for 0.4 percent of total schools that school year. In 2016, 32,958 students in Pennsylvania, about 2 percent of the public school student population, were enrolled in cyber charters. Jaden’s education at Agora was initially supposed to be temporary, though it became evident to Angel and his mother that it was the best option. 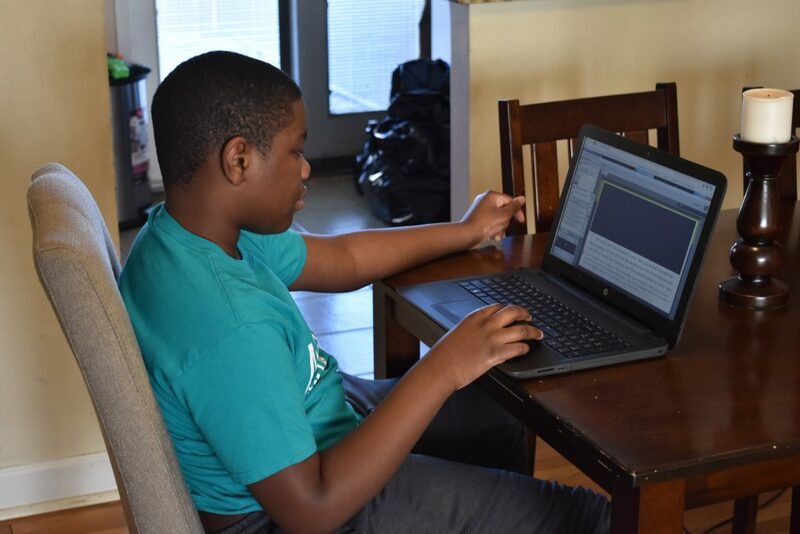 His mother passed away and he was diagnosed with ADHD, making the personalized attention cyber schooling provides vital to his education. “For me, the greatest reward is building the trust with the families who I love, and seeing the progress of the children,” said Carla Krochak. She’s a family coach at Agora, though readily admits her title is somewhat of a misnomer. She meets with families regularly to discuss the student’s performance and background, taking a holistic approach to understanding each student. A Northeast resident herself, Krochak doesn’t work with Jaden and Angela, though recognizes them from the Day Outs. “We go that extra layer that a normal teacher can’t,” she said. After class is done for the week, Jaden asks to go upstairs to play video games. Downstairs, Angela says he’ll be enrolled at Agora for the foreseeable future, and he’s in a college family. She herself completed her college education when she was in her 50s.